The Persimmon Tree’s Jasmine Ancient Beauty is a unique offering. Instead of being paired with a light green tea, the jasmine pairs well with the robust, dark oolong tea leaves in this blend. The result is a smooth, full-bodied tea which is quite pleasant to drink. Our Jasmine Oolong Tea features fragrant jasmine blossoms permeated with pure hand-harvested oolong loose-leaf tea, giving an amber peach color with a fresh aromatic bouquet and sweet refreshing taste. This beautiful Oolong Jasmine Tea tea comes from thousand year-old trees on the Jing Mai Mountain in China. The protected forest reserve is enshrouded in mist and located approximately 5,000 feet above sea level. The best buds and leaves are hand plucked by scaling the tall trees and then oxidized using a traditional oxidation process to reach a specific maturation point. They are then crafted with traditional scenting techniques using whole jasmine blossoms. Drink the Jasmine Oolong Tea and experience a real one-of-a-kind treat. 3-5 minutes at 195 degrees F.
I found the look of this tea to be very pretty with the contrast of white jasmine blossoms against the dark brown-black of the tea leaves. The oolong leaves are large, loose bundles unlike other tightly rolled oolongs. The aroma is fragrant, but not overwhelming. 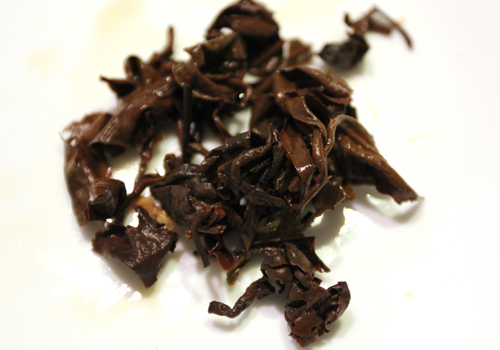 After steeping, the liquor comes out a darker brown than you’d expect with most oolong teas, which typically appear golden. It tastes herbal and slightly sweet, against what is like a full-bodied black tea. Surprisingly, the taste doesn’t remind me of jasmine- it’s more medicinal and thick. I experimented a few times with the leaf to water ratio on this- I’d recommend going easy on it. If you like enjoy smooth black teas with a punch of flavor, this tea would be great for you. 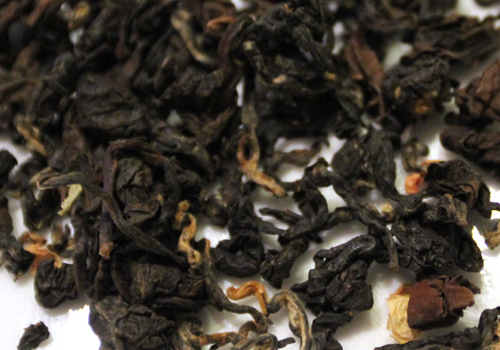 Overall it’s a well-rounded blend that isn’t overpowered by either oolong or jasmine. Instead the two contrast nicely together for a unique and pleasant taste. 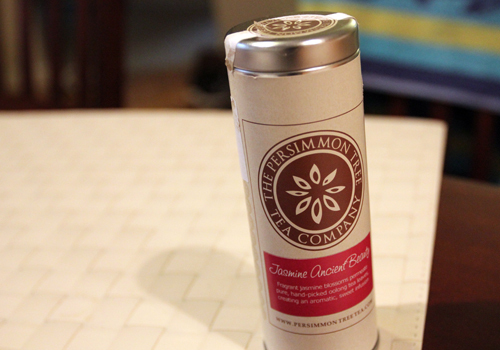 You can buy this tea from The Persimmon Tree’s website – Jasmine Ancient Beauty Oolong tea. Price is 1.5 oz at $15.99.